Phil Heath dominated the judging, and although Cutler made improvements for the finals show, it wasn’t enough to hold off Phil. Phil Heath became Mr. Olympia and one of 13 men to claim that prestigious title. Jay Cutler had a very good chance of winning his fifth Mr. Olympia title this year if he didn’t have any late-season injuries. He needed to be at his all-time best, but he wasn’t, and he got injured. Despite many close calls in previous Olympia competitions, Jay has managed to fight for his title and has come out on top. This time he didn’t. When Jay walked out on stage for the first time during the judging, all eyes went to his left arm. He had a lump and some discoloration on his upper bicep next to his delt tie-in. It was a suspicious-looking area, but it didn’t seem to affect his posing or display. Immediately after the judging, outside the Orleans Arena, I saw Steve Blechman showing some photos on his phone to Flex Wheeler. The photos were of Jay Cutler; Steve was zooming in on Jay’s left arm and it looked fine. Those photos were taken a few weeks out before Jay injured himself in a MuscleTech photo shoot. He tore the upper portion of his bicep and bruising had occurred. Jay was hoping the tanning products would cover it up, but they didn’t because the injury was still very noticeable and distracting. The injury itself didn’t affect Jay’s posing much. His shoulder, however, did seem to droop just a bit when standing relaxed. The biggest factor against Jay was that he was holding some water at the judging and wasn’t as sharp as he has been in the past. His back in particular was noticeably smoother. His legs also seemed to be down in size (or maybe that was due to standing next to Phil and his legs were actually up in size). Jay did have the opportunity to be in the last callout with Phil Heath and that looked like it would seal up second place for him. In that final comparison, Heath shined in every single pose. It was clear at that point that Jay Cutler had zero chances of actually winning the competition. It didn’t matter if he was the current champ or not. The best he could hope for at that time was second. No one I talked to between the shows thought Jay had any chance of winning this year. Many even thought the chances of Jay getting third or fourth place were very good. Actually, it probably would have been a good idea to have another callout with Jay, Kai, Victor and possibly Dennis too. Phil had a lock on first, but in fairness to the other guys, Jay didn’t have a lock on second place and another comparison should have been done. I’m not really sure why the judges didn’t ask for that callout. At the end of the night during the finals, Jay knew Phil had it. At one point Jay even flashed up two fingers signifying he was going to be in second place this year. When Phil was announced the winner, Jay displayed great sportsmanship and showed that he and Phil have true friendship as well. I’ve seen Phil compete at many shows and have interviewed him a couple times. When I saw him this year, I was amazed at the progress he made  again! From the 2008 Iron Man, where I saw him compete for the first time, until now, he has really transformed himself. And I was impressed with his showing at the Iron Man! Phil had the size, the shape, and the conditioning. He had it all this year. From the moment he walked on stage, Heath was obviously the guy to beat. Not even Cutler was able to touch him. He dominated the 2011 Mr. Olympia much like Cutler did in 2009 or when Coleman blew everyone away in 2003. Phil Heath was that good. Phil added size since last year. His back was a little thicker, particularly in the lower lats. His thighs were fuller and even his delts were a bit bigger to give him more width. Overall, his physique appeared fuller and rounder, combined with tremendous conditioning. Dexter Jackson wasn’t quite “The Blade” this time again, but he did make improvements from his shows earlier this spring. At the Flex Pro when Evan Centopani beat him and then Dexter had a lower-than-normal placing at the Arnold Classic a couple weeks later, I started thinking Dexter was heading downhill because of his age. I didn’t know if he’d bounce back. He did make improvements for this Olympia and he seemed genuinely pleased with his results, which was evident by the way he and Charles Glass were interacting after the judging outside the Orleans Arena. Both men were in a celebratory mood. Dennis Wolf looked like he might be gunning for third place when he came out on the Olympia stage first to begin the night of judging. As Friday night continued, he seemed to fade a bit and wasn’t as sharp and full as he was in the beginning of the night. Perhaps the other lengthy events before the men’s judging caused a small mistiming of his prep. The same thing happened last year at the finals. Wolf getting fifth place seemed fair. He could have been fourth ahead of Victor, but probably not ahead of Kai. It would have been interesting to see if he would have been bumped to sixth if Branch Warren were in the mix this year. Victor Martinez came on strong in fourth place and was the best he has looked in years. I don’t think he matched his 2007 Olympia showing, but he was close. He still has a film of water he needs to eliminate. If he could get as dry as the terrain from Las Vegas to Los Angeles, he might be able to give Phil Heath a run for his money next year. Kai Greene seemed happy enough with third place as he kind of skipped across the stage to receive his third-place medal and check. He needs to come in a little lighter to be a contender for the title. He’s just too heavy and needs to be at 5-10 pounds lighter to be sharp enough at this level of competition. If Kai can do that for next year, like Victor he could give Phil a challenge. Kai has plenty of size; he just needs to pull out all the stops and come in completely peeled like his 2009 Arnold Classic condition. As stated earlier, many people saw Jay in third or fourth place. That means there is the possibility that Kai and Victor might have beaten Jay if another, separate callout would have been utilized by the judges. As it stands, however, they didn’t have an additional comparison, so Jay has still placed either first or second at the Mr. Olympia for the last 10 years. 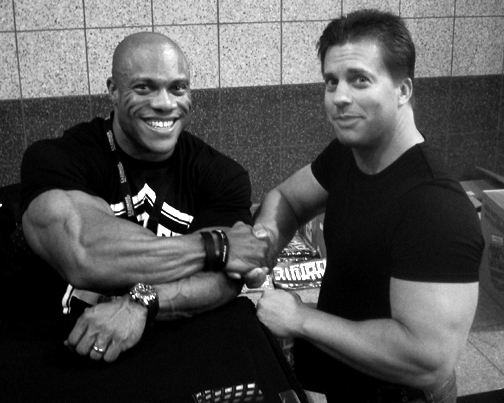 Phil Heath and Jay Cutler showed the world that competition can be friendly and rivals can also be friends. This is a sport where athlete conduct has been, at times, disgraceful. Competitors have taken their medals off in disgust on stage because of a low placing or they’ve shown anger and hostility in some way after a judge’s decision. In contrast to those kinds of incidents, the top two men in professional bodybuilding showed us what class and sportsmanship are all about. It’s good for our sport and it’s good for all of us. Congratulations, Phil and Jay on a job very well done. © 2012 Myron Mielke All rights reserved.